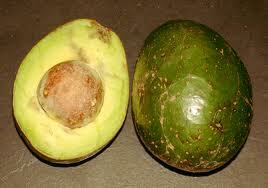 AVOCADO or butter fruit (Persea Americana) is a subtropical, evergreen fruit tree. Its trees can be short, spreading and fairly bushy or grow erect to a height of 20 m or more. The demand for this fruit has been increasing over the past few years in many countries. It has become an important fruits in the international trade. Mexico, Brazil, USA, Israel, New Zealand, South America and South Africa are major producers of avocado. In India, it is grown as a backyard tree and is found in small pockets on hill slopes of Tamil Nadu, Kerala, Karnataka and Maharashtra. Avocado is consumed primarily as fresh and is neither sweet nor sour. The edible pulp has a nutty flavour with a buttery texture. It is reputed as a nourishing food of high dietetic value. Its nutritional vales are comparable to ripe olives with an average of 2.1 % protein, 1.32 % minerals and 24-26 %fat. It is also a good source of potassium, iron and vitamin B. Since the fruit contains not more than 1% sugar, it is recommended as high energy food for diabetics. Its energy value is twice as much as banana fruit. Avocado is eaten fresh on breads or in salads with lemon juice, salt and pepper, but in India people prefer to eat it after mixing the pulp with sugar. Avocado oil is used in preparation of cosmetics. Avocado comes up well in tropical and subtropical climate with a mild winter at an elevation of 600-1,500m and an annual rainfall of 125 -180cm. However, it can be grown even in areas with low or ill distributed rainfall, if the irrigation facility is assumed. High humidity during flowering and fruit set is necessary to secure a good crop. Varieties of the Mexican race and its hybrids are well adapted to the cool climates, while the West Indian types are best adapted to the low land tropical conditions of high temperature and humidity. The Guatemalan race is intermediate. Because of the differences in adaptation, avocado offers good opportunity for selecting an appropriate variety for a given climate. Thus, it is presently grown on a commercial scale in different parts of the world having extremely different environment. The climate extremes range from almost desert condition (Israel) to highland tropics (Mexico) to cool mist belt conditions (Queensland). However, planting of this crop in sites with violent winds should not be taken up or else windbreaks must be provided, as avocado plants have branches that break easily. Cultivation of avocado can be taken up on loamy or sandy loamy soils of alluvial origin having 5-7 pH. This crop is sensitive to waterlogged conditions; hence growing it on poorly drained soils should be avoided. Shallow soils, soils with gravelly sub soils and those poor in organic matter are also not suitable for avocado cultivation. It does not tolerate salinity, excepting varieties of West Indian race. This fruit has been grown successfully on a limited scale in India in the hill slopes of Nilgiris, coastal region of Karnataka, Kerala and Maharashtra. More than 400 varieties are known in avocado and they are classified into 3 distinct horticultural or ecological races: Mexican, West Indian and Guatemalan. They may recognize as subtropical, semi tropical and tropical. Each race is identifiable by their unique characteristics like size, peel, and texture and maturity date. Guatemalan fruits mature in 9 months and have smaller seed and tight cavity. West Indian cultivars have generally fruits with smooth leathery skin and those of Guatemalan coarsely granular skin. West Indian – Pollock, Simmond, Black Prince, Fuchsia, Peterson, Waldin. Guatemalan – Taylor, Linda, Queen, Itsamma, Benik. Many cultivars of commercial significance are hybrids of these 3 races. They are Fuerte, Collinson, Winslowson, Fair child and Long. The most leading avocado cultivar in the world Furte, a Mexican x Guatemalan hybrid, bears pear shaped fruits each weighing on an average of 400g with a smooth, thin, dull green skin and a tendency towards alternate bearing. The pulp has a buttery texture, a rich nutty flavour and contains oil up to 26%. Nabal, Hass, Lyson, Dickinson, Linda, Pollock and Waldin are some important cultivars of California and the coastal florida. Sri Lanka grows mainly Trapp, Pollock, Dickinson, Duttan, Lyon, Mayapah and Gottfried. In parts of south India and Maharashtra where avocado is successfully grown, 2 varieties; purple (West Indian race) and Green (Guatemalan race) are popular. Purple variety bears pear shaped fruits with a long neck weighing about 450 g. The fruits have smooth, moderately thick, leathery skin and the pulp is firm, deep yellow, fine in texture with a rich and nutty favour. The fruits of Green variety are oval to obovate, large (450-680%) with rough, moderately thick, brittle skin. The flesh is soft, greenish-yellow with a mild nutty flavour. Single trees of avocado are not productive at times. Seed propagation is commonly practiced. However, to ensure superior traits of the parent trees it is necessary to prefer asexual propagation which can be achieved by cuttings, layering, budding and grafting. Budding and grafting are most popular. Seeds quickly lose their viability, and hence should be sown soon after extraction from the fruit. Soaking of the seed in water for about 8 hr or removing the seed coat and a thin slice at top and bottom may accelerate germination. Seeds are planted in nursery at a spacing of 30cm x60 cm and then transplanted to polybags when they can be transplanted to their permanent location. Generally, vigorously growing seedlings irrespective if source are used as rootstocks, however, cultivars have also been recognized with specific objectives for using as rootstocks. For example, Duke Seedlings are resistant to root rot and cold hardiness and Pollock stock can overcome salinity problem. Similarly, Green and purple also do well as rootstocks. Green imparts more vigour to the scion than purple. Side, veneer, cleft grafting of shield budding on 30-40 cm tall, robust, succulent seedlings is generally practiced. Trees on rootstocks produced by clonal propagation usually bear fruits early and more uniform than grafted on seedling rootstocks. Before establishing a plantation, the field should be well ploughed, harrowed and leveled, keeping in mind the possible intercropping, often with vegetables. The commonly recommended spacing is 7 m x7m, but it may vary from 6-12 m on the square. The spacing is determined by the crown size of the variety and soil type. Trees in deep soils with a high percentage of organic matter need more space, because they grow taller and larger under these conditions. Pits of 60 cm x 60cm x 60cm are dug and left open to sun for about 10 days. These are then filled with top soil mixed with approximately 30 kg of well decomposed farmyard manure or leaf mould. Add 20 g of super phosphate at the base of the pit for good root growth. Planting can be carried out anytime during the year, but when adequate irrigation facilities are lacking, monsoon is the appropriate time for planting. While planting grafts, it is important to keep the graft joint well above the ground. Once planting is done, regular watering is essential till the plants establish. Like most tropical trees, avocado has a good natural shape and hence it need not be controlled by pruning. But selective and mild pruning of dead wood, basal branches touching the ground and very old devitalized branches which have seized to produce fruits may be attended to once the harvesting season is over. Severe or unnecessary pruning lowers yield by eliminating potential flowers produced on young branches at the periphery of the tree. Nutrient requirements of avocado vary according to variety, spacing and soil type. Before fertilizer application, the basin should be weeded and the fertilizer broadcast but not within 30 cm radius of the trunk. After applying fertilizer, irrigation is useful if soil moisture is not adequate. Though it is difficult to specify exact dose common to all soils and varieties, a recommended fertilizer dose is given in table 1. *expressed in the form of the nutrient element. While, P and K deficiencies are less conspicuous, N and Ca levels in leaf markedly influence yield, fruit size and postharvest quality. The Mg, B and Fe are also important. The growers are advised to get the soil tested and consult soil specialist for specific recommendations. In California, healthy leaves of avocado Fuerte, have been reported to conation 1.8% N, 0.15% P, 1.5 %K, 2.2% Ca, 125ppm Fe, 50 ppm Mn, 50ppm Zn and 45ppm B. After planting, young trees must be watered and supported by stakes. To protect trees from sunburn, they should be provided with shade. Sometimes, the trunks of the young trees are whitewashed. To start with 60 cm2 basins around the plant is adequate, however, once in a while; size of the basin should be expanded with increase in the canopy size. Other aftercare operations involve regular watering during dry periods, occasional weeding, shallow digging of the basin so as not to injure the surface roots, removing of sprouts on the rootstocks (in case of grafted plants), Attending to plant protection measures and Manuring. Intercropping in young orchards can be taken up by selecting a suitable vegetable crop as it gives additional income to the growers. Moreover, an intercropping system keeps the soil cool, adds organic matter, suppresses weeds, improves soil structure and may fix nitrogen. But these crops should not be raised very close to the avocado trees lest they compete with them for nutrients. 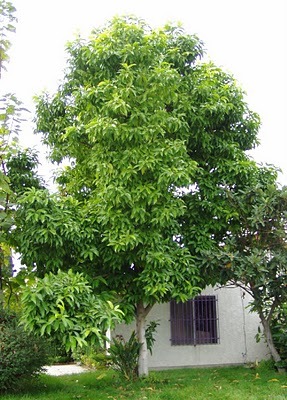 Commercial avocado is successful if trees are regularly irrigated and the frequency should be adjusted depending on soil and weather conditions. The avocado trees show water stress suddenly by shedding fruits and leaves or by wilting as they have shallow root system. Loose and sandy soils require larger quantities of water than heavy soils. Generally in summer, trees should receive irrigation once in 10 days and adequate soil moisture after fruit set is necessary to sustain fruit growth, because and setback in growth is irreversible. The regular harvesting commences from fourth year. Its fruits are harvested in August-September in south India. They should be plucked when they are fully mature which can be assessed by change in fruit color, fruit size and sometimes the oil content. In purple variety, a fruit are plucked when they show a purplish blush, and in Green when they develop yellow tinge and once the glossy shine diminishes. If fruits are retained for longer periods, they drop before softening. Picking poles with a net or cloth bag at the end can be used for harvesting the fruits. Although a 25 year old tree yields as high as 2,000 fruits, a yield of 400-500fruits /tree is considered fairly well. Well mature avocado fruits ripen in 4-5 days after harvesting but ripening can be accelerated by ethylene (10ppm) treatment. Ripening takes place satisfactorily at 15`-21`C and is hampered above 30`C. Mature fruits can be held for a month at 6`-9`C coupled with 80-90% humidity. And extension of shelf life can be obtained by storing at low temperature after enclosing the fruits in polythene bags. The ripening time of fruits stored is generally always less then the non stored fruits. Packing is done in a single layer in well ventilated wooden boxes so that they arrive in markets in good condition.